oh wow i love these spaces! especially that beautiful pomegranate wall! 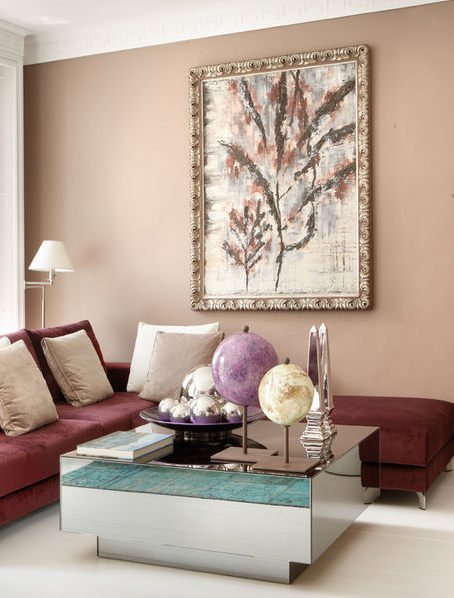 The neutrals balance the pops of color in this space. Everything still feels muted and relaxing.. perfect place to read and breathe for a while..
i'm loving the colour scheme and the overall style of the interior space! that rug on the living room floor is gorgeous! What a great space! I love that last picture - looks like a wonderful office of sorts! Those colors are scrumptious! Those marshmallow brown chairs especially and the hints of purple with pops of turquoise are just exquisite! Love the harmony! These interiors are so gorgeous and have a different flair that leaves a lasting impression!